The Welsh Rugby Union has confirmed chief executive Roger Lewis had informal talks with leading English clubs about a British league in 2012. 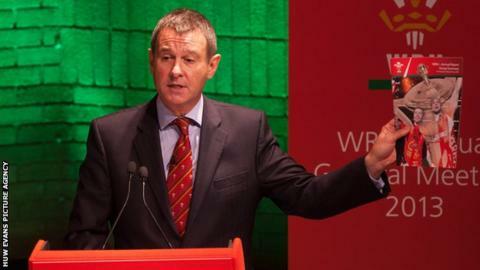 But the body representing England's clubs denies the WRU's claim that the idea was rejected "out of hand". A Premiership Rugby spokesman said: "We did not reject the idea out of hand. "We asked for further information (before we could present the idea back to the Premiership Rugby clubs), but that information was not forthcoming." Minutes of a meeting between the WRU and Welsh regions' supporters revealed the 2012 discussion. The regions are in dispute with the WRU over issues including a possible Anglo-Welsh league. The WRU confirmed a statement Lewis is reported to have made at a meeting to the Joint Supporters Group of the Welsh regions at the Millennium Stadium on Monday. Lewis, WRU chairman David Pickering, Wales coach Warren Gatland and WRU finance director Steve Phillips were at the meeting to answer questions from supporters of Scarlets, Ospreys, Blues and Dragons. The minutes claim Lewis "explained he had proposed a British and Irish League last year to PRL (Premier League Limited) alongside a deal with BT but this was rejected," when he was asked about an Anglo-Welsh league. The Ospreys Supporters Group subsequently published the minutes. The WRU confirmed: "The Welsh Rugby Union informally discussed the possibility of a British and Irish competition with [PRL chief executive] Mark McCafferty in Dublin last year, prior to any of the existing broadcast agreements being signed, but the idea was rejected out of hand at the time." The WRU and the Welsh regions are embroiled in a row following the leading English clubs' decision not to play in next season's Heineken Cup. The regions have stated they want to play against English clubs, rather than be forced by the WRU to compete in the European Heineken Cup. Representatives from the Ospreys, Blues, Scarlets and Dragons have met the WRU but have failed to reach agreement on any of the issues. Wales' regions could take legal action for the right to play in cross-border tournaments without permission from the WRU and there is increasing speculation they will not sign the participation agreement with the union before the union's 31 December deadline. The four regions have seen a number of top Welsh internationals depart for clubs in France and England during recent seasons. According to the supporters' minutes, Wales coach Warren Gatland claimed at the meeting the Ospreys had not offered a new deal to Wales and British and Irish Lions prop Adam Jones, who is out of contract in summer 2014. The BBC understands the Ospreys have been in talks with Jones about a contract, but a spokesman for the region has said: "We never comment on an individual's contract situation as it is a private matter."